Another feature you requested frequently was the option to disable/hide columns in the items table, and we just finished it. We had several workarounds to hide the columns, but they all were little “hacks” that didn’t fulfil the real need, so we decided to do the real thing, and here’s what we got. Now, below the items table you’ll notice the “Configure Columns” link. Once clicked, the menu will be shown where you can disable/enable one column. The change will be immediately applied in the items table and the corresponding column will be hidden/shown. 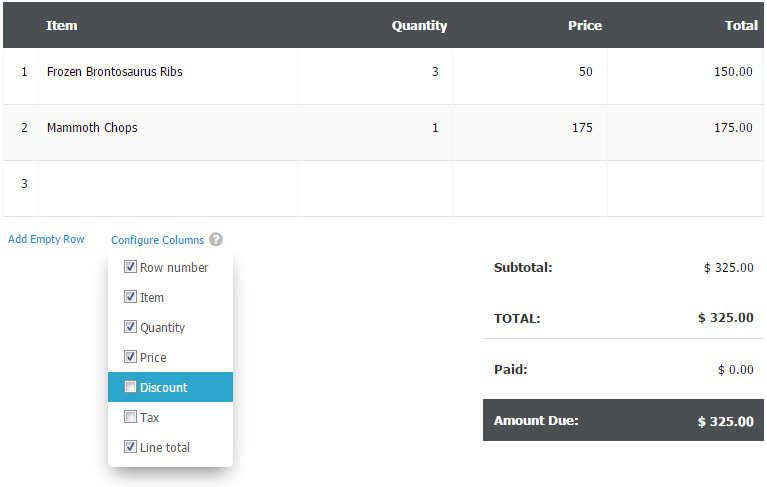 For example, in the table below the “Discount” and “Tax” columns are unchecked so they won’t be displayed in the editor and in the final invoice. Like this? Share your thoughts in the comments below.